Learning to play over the Internet or land gambling establishment, primarily the player should know the game rules. There are lots of games offered at the Las Vegas gambling establishments starting with online slots, roulette online and blackjack in online casinos and to the selection of poker variations. Texas Hold'em poker that you may play in all card rooms over the globe is played with the traditional 52 cards deck with from two to eleven persons. This poker variant uses the standard hand rankings. Before all gamblers are dealt pocket cards two of them post the obligatory blinds. Then as the poker rules dictate each player gets two hole cards. The betting round follows. The players are able to fold, bet, check, call and raise depending on the actions of the preceding gamblers. Betting is considered to be completed as soon as all gamblers have posted equal amounts into the bank. Then dealer places three community cards also called the flop. The next betting round proceeds and one more face up card (also called the turn) is shown in the middle of poker table. The players make bets and the final exposed card (also called the river) is shown. The last round of betting finishes by the showdown when all the players still in the hand reveal their cards and the winner is chosen according to the strongest poker hand. Each gambler is allowed to use any of his or her pocket cards and any number of five exposed cards on the poker table to make the hand. In case of tie the pot is split. When all five community cards form the strongest hand in the game the pot must be divided between all players. Seven Card Stud is also popular poker variation. The poker rules of this game are not difficult and the essential thing you are to remember is that all players are dealt seven cards, some of them are hidden and some face up, and must make the possible strong hand out of these cards. All gamblers at the table post the ante. Then each poker player is dealt two face down and one face up cards. The gambler that has the weakest face up card makes the small bring-in. The betting then proceeds. 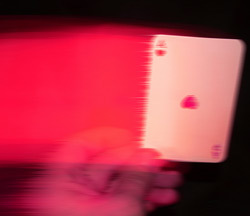 One face up card knows as the turn or fourth street is dealt to every gambler. The players bet starting with that player who holds best face up cards and one face up card (the fifth street or river) is dealt. Again the round of betting follows. The sixth card called the sixth street is dealt followed by round of betting. When the last (known as seventh street) card is dealt face down the gamblers make bets for the last time. In the showdown the poker players turn over the cards and the winner receives the pot. There exist two main Omaha poker versions, Omaha Hi and Omaha High Low, but the first game is the most popular. The High/Low form is gaining its popularity mostly in the USA casinos. The Omaha poker rules are similar to the rules of Texas Holdem with some differences. The first one is that the players receive four pocket cards not two each and are to use two of them and three of five face up cards to make their hands. All the betting rounds are the same like in Texas Holdem. The player with the strongest five card hand wins the pot. One more peculiarity of Omaha is that the players are not allowed to play the board. After Caribbean Stud poker variation was played as the experimental card game it turned out to be so popular that most card rooms started to offer it. According to the Caribbean Stud poker rules the players first post the ante and are dealt five cards each from the standard deck. The dealer is also given five cards one of which is face up. Then the players should decide whether to give up or continue the game. In case you prefer to continue you are to match the bet by wagering the amount equal to the ante. The dealer reveals his/her cards. If he or she qualifies (holds Ace and King or better) the hands are checked for the win. In another case the players are paid. So, if you hold better hand than the dealer has you win the ante and call bet. There is the special bonus payout table that makes game more involving. Before you start gambling leran the poker rules and all payout tables to understand your winning probabilities. In addition, at most casinos, especially online ones, you will meet other game variations and video poker that is based on draw poker games. There you will also be able to read the latest poker news.